Need to build your brand, thought leadership and business but don’t want to use pay-to-play tactics? Did you know that guest post content marketing could help you accomplish this objective? Maybe you think guest posting is only for blogs. Or perhaps you’re too overwhelmed with your own content creation to develop content for other entities. Would you be interested if you could add guest blog posts to your content marketing offering without additional resources? 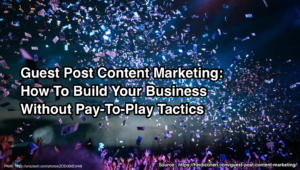 So I’ll show you how to incorporate guest post content marketing into your documented content marketing strategy for measurable success. 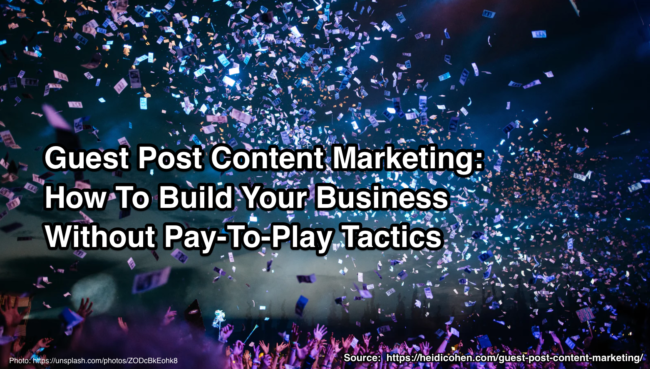 Guest post content marketing is high value, quality content you create specifically to publish on other people’s media entities to reach a broader audience. Create these articles as part of a larger content marketing development project. 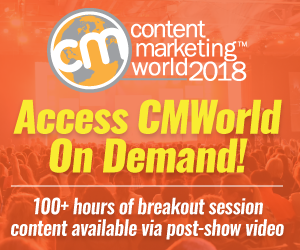 Live content like conferences and webinars. Since guest blogging traditionally focuses on building backlinks from digital entities to improve domain authority, you may be surprised to see offline media and live content on the list. But solely focusing your guest content marketing on link-building is short-sighted. Although it seems counter-intuitive, publish your best content on other people’s media to reach the broadest possible audience. Unless you write for a top ranked blog, other platforms have greater reach and community. To become known and trusted, your potential audience must hear your ideas multiple times before they believe you. Orbit Media’s Andy Crestodina uses content hubs to build authority for specific keyword terms. Target the keyword phrases you want to be known for. Integrate them into your content marketing mission and strategy. 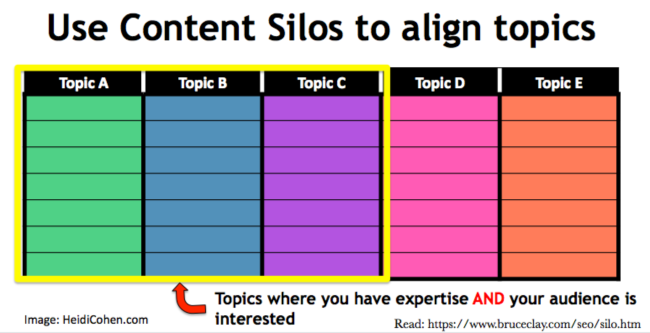 SEO Bruce Clay calls these words category silos. Expanding your visibility to build branding and thought leadership. It also adds backlinks build your domain authority! Aaron Orendorff uses list posts and influencer outreach built on quality networking. Unlike many would-be guest bloggers, Orendorff isn’t afraid to give-away his best work. Orendorff’s primary guest blogging goal was to build his reputation as freelance writer. The greatest gift you can give yourself in guest content marketing is a meaningful link outside your author profile to high-value content you’ve produced. The trick is to make the link itself valuable to the publication you’re guesting on. For example, I included a sub-point on the challenge of B2B influencer marketing in a MarketingProfs article — “Three Top Challenges of Influencer Marketing, and Its Past, Present, and Future.” Michaela Alexis addressed this challenge in another article of mine on B2B ecommerce. In this piece, Alexis not only shared original insights but also a behind-the-scenes look at her LinkedIn analytics. Her insights were genuinely valuable to the MarketingProfs audience, relevant to the topic, and allowed me to link back to my content. Win, win, win! Determine where your target audience spends its media time. Know your audience’s content consumption habits. BTW—Here’s the full analysis of the Blogger Survey and set of blogging tactics for 2018 and beyond. But most bloggers publish only 2 to 4 posts per month. 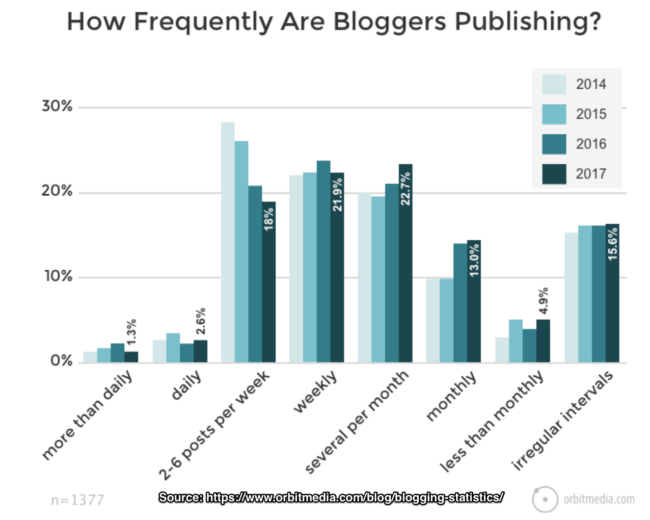 Therefore add one blog post per month to your current blog creation to publish elsewhere to make your guest blog posting 20+%, higher than your peers. Publish 4 blog posts on your blog to establish content consistency. Publish 1 blog post on a third party blog to build your thought leadership and brand. This can’t be the same content you publish on your blog or there’s a duplicate content issue! Since many websites allow you to republish your guest content after an exclusive period as long as you link to the original, you don’t have to worry about content resources. Check guest blog post guidelines before republishing. Accept guest blog posts on your media entities. Actionable Marketing Guide doesn’t accept guest posts. 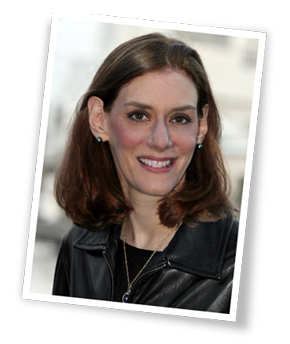 Create ‘Evil Twin” content when you develop foundational or big rock content. (Hat tip: Crestodina) Use existing content resources to create 2 articles from different perspectives at the same time. Develop cyclical content that minimizes content marketing resources. 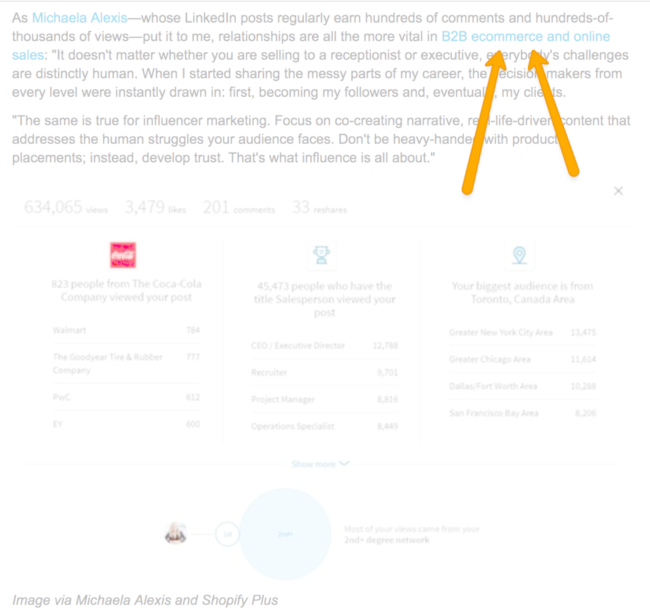 Curate other people’s content or interview other people. To get plum guest blogging opportunities, play by the rules. Create the best, non-promotional content you can for guest post content marketing. If you aren’t willing to do that, then skip guest blog posting. Support the guest blog’s mission statement and add value to their audience. Be an active community member on the blogs where you want to get published. Pay-it-forward. Do the hard work to create quality guest content. Your guest posts have to be your best content ever. Become a dedicated reader of the blog. Participate in the conversation wherever it happens: blog or social media. Share the content consistently across social media platforms. Show your interest and appreciation for their work. Use a legitimate business email address. Even if you use your Gmail address everywhere else, editors like the legitimacy of a business email address. 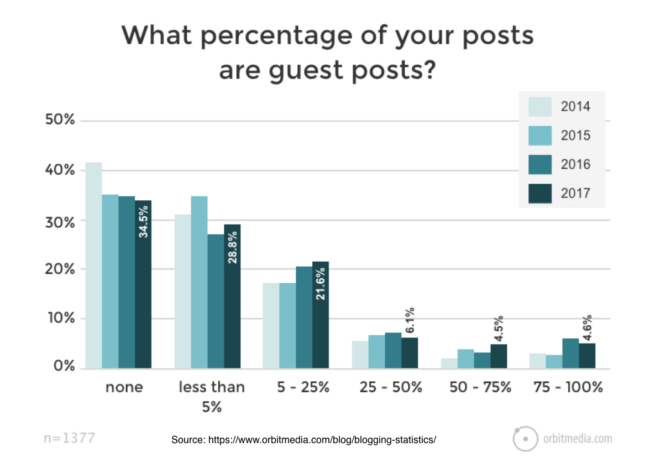 Don’t limit your guest post content marketing to blogs. It hinders your reach. For example, David Meerman Scott, author of Real Time PR and Marketing, publishes his latest thought leadership on both his blog and LinkedIn Publishing to maximize his content amplification. Use social media publishing platforms such as LinkedIn Publishing and Medium to supplement your blog. 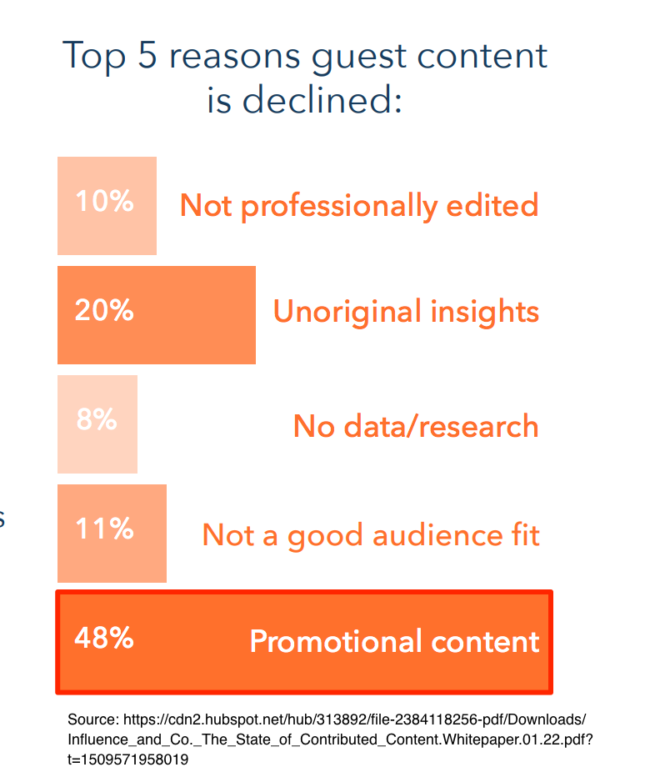 Based on BuzzSumo, they’re untapped publishing outlets. Syndicate your content to an aggregation site like Business2Community. Unlike other options, syndication is republished content. Get a blog buddy. Publish each other’s blog posts as an exchange or augment each other’s publishing. Reach out to places where you advertise, either one-off articles or regular columns. This works well for B2B marketers. Present at conferences and webinars. Provide your content to other venues. Webinars are a great way to build your email file. Participate on other people’s roundups and podcasts. Reach out to bloggers that regularly engage thought leaders. Guest post content marketing isn’t about you. It’s about contributing to the broader community to build your brand and thought leadership across platforms, digital, offline and live events. Use guest blog post placements for their reach, not the backlinks. This isn’t a pay-to-play strategy. Rather guest blogging requires quality content creation and relationship building. If you’re unwilling to give away your best stuff in exchange for audience exposure skip guest post content marketing and then try another approach. Instead share your best content everywhere and reap the rewards! Tags Aaron Orendorff, Andy Crestodina, Gini Dietrich, guest blogging, Social Media Examiner. Bookmark the permalink.